American Ultra starts with a stoner who used to be an agent and was brainwashed into forgetting his past. He's the result of a program created by the CIA experimenting on inmates to make the best agent and although the movie states that some are successful, others are failures.Things get going when his previous skills are activated by certain words. Mike Howell (Jesse Eisenberg) is the ultra agent in this flick but he's not alone. The only person who can put up with him and his addiction is his girlfriend Phoebe Larson (Kristen Stewart). Although he doesn't seem like it at first, Mike is the best success they ever got out of the program and when agent Victoria Lasseter (Connie Britton) finds out the CIA plans to terminate Mike, she goes head-to-head against the man behind the plan, agent Adrian Yates (Topher Grace). Lasseter goes out of her way to save Mike but soon comes to realize he is able to take care of himself. American Ultra features action and gory scenes. Not over the top gory, but just right. Mike and Phoebe's relationship was not over the top lovey dovey either, and enjoyable to watch. The acting was good but one CIA agent was just too into his role. Luckily, he makes his main appearance at the very end and doesn't ruin anything. 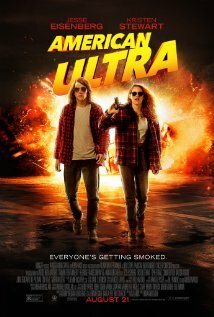 If you want to see what a stoner ultra agent can do, you will get a kick out American Ultra. You'll laugh at some scenes and wonder why would he do that in others. This is not your typical save the world agent movie, but one where the agent saves himself and it's fun to watch.